We’ve already put together an article with tips and guidelines about choosing the proper sized cuff bracelet. Now I want to add some personal observations and put my own wrists up as a case study. I briefly mentioned my wrist size in the main article. More specifically, my right wrist, which is where I usually wear a cuff bracelet, measures about 6 7/8″. My left wrist, where I wear a Native American watch, is about 6 ¾”, about 1/8″ smaller. I suspect my right wrist is larger because I am right-handed and because I use a computer mouse. You might find a similar difference between your two wrist measurements. In the winter, both of my wrists measure about 1/8″ smaller than the above and in the summer, they can measure 1/8″ larger. I generally like to wear my looser and more open bracelets in the summer and my wide cuffs in the winter. I wear narrow cuff bracelets in front of my prominent wrist bone, towards my hand. I wear wider cuffs behind or over the prominent wrist bone. Right now I am wearing a 6 ¾” heavy silver inlay bracelet cuff that is only about 3/8″ wide (so it’s in front of my prominent wrist bone) and it is PERFECT. It doesn’t move on its own but if I grasp it on each side and lift up gently, I can create a ¼” space between the bracelet and the top of my wrist. And if I wanted to move it behind my wrist bone, I could easily move it there. But left on its own, it tends to rest in front of my wrist bone and I don’t even know it is there. I have a 1″ wide Hopi cuff that is 7″ total inside circumference and a 1 ¾” wide heavy Navajo cuff that is 7″ total inside circumference. Both of these have a gap of about 1 ¼” and they go on and off easily and fit just a well as my 6 ¾” narrow cuff. So in my case, when I wear a wider cuff, it needs to be about ¼” larger than a narrow cuff. I hope this information helps you interpret and use the bracelet dimensions we have on our site to find a bracelet that fits you and is comfortable to wear. It is always best to measure a similar cuff that fits you perfectly, but if you don’t have one, you should be able to measure your wrist to find a bracelet that fits. Many men wear a Medium bracelet in the 7-7 ¼ inch range. They might have a wrist that measures 7 ½ and find that they like the fit of a 7 ¼” bracelet. Some women buy Large bracelets for their boyfriends or husbands just because they think a man would just naturally need a Large, but it is not necessarily so. With any bracelet, squeezing will likely make the bracelet an odd shape. Many small women buy Medium bracelets hoping they can “squeeze” the bracelet together to make it fit them. Yikes! First of all, if you squeeze a stone bracelet, you risk loosening the stones. AND you’ll probably end up with a gap so small you won’t be able to put the bracelet on or take it off very easily – it will end up more like a bangle bracelet! To adjust a bracket, use this method. 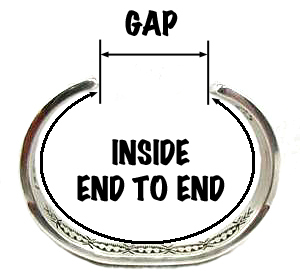 The gap is what allows you to put a bracelet on and take it off with ease. It is also what assures the bracelet won’t fall off. There is a “sweet spot” as far as the gap measurement that will work best for you. For me, the perfect gap seems to be 1 1/8″ to 1 ¼”. It allows me enough on-off space but not so much that the bracelet is not secure. That’s why it is best to get a bracelet that approximates your wrist size and shape and has a reasonable gap, something on the order of 7/8″ to 1 ½” depending on the size of your wrist. Too small of a gap and it will be torture going on and off. Too large of a gap and the bracelet could turn on you wrist and even fall off ! If you don’t have a cuff bracelet to use for comparison, then measure your wrist where you want to wear the bracelet. There are several ways to do this. 3. Cut a strip of paper approximately 8″ long and as wide as the bracelet you would like to wear. Wrap the paper around your wrist where you would wear the bracelet. You might secure the paper with a piece of tape to get a better feel of the fit. Make a mark where the end of the paper lays on the wrap. Remove the paper and measure from the end to the mark for the circumference of your wrist. 2. Inside circumference from end to end, plus the gap measurement. These two added together equal the total inside circumference which corresponds to your wrist measurement. For example, if your wrist measures 6 1/2″, a bracelet that has a 5 1/4″ inside circumference end to end and a 1 1/4″ gap has a total inside circumference of 6 1/2″ and should fit you well. 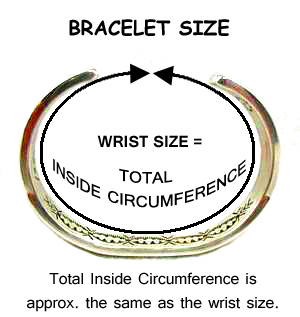 Example: If the Inside Circumference end to end is 5″ and the Gap is 1″, the Total Inside Circumference would be 6″ and would be suitable for a wrist approximately 5 3/4 ” to 6 1/4″ depending on how tight or loose you like to wear your bracelets. I can’t stress enough that the best way to get a perfectly fitting cuff bracelet is to measure one that fits you well and compare its measurements to the measurements on the page of a bracelet you are considering buying. When I wrap a string or dressmakers cloth tape measure around my wrist it measures between 6 7/8″ and 7″ and yet the bracelet I am wearing today measures 6 5/8 total inside circumference, which includes the gap. So the bracelet that fits me the best is actually 1/4″ smaller than my wrist measurement. Such a bracelet is steady, does not flop around, yet does not dig in anywhere. It is comfortable and perfection in fit. So bear that in mind as you shop. You may likely prefer a bracelet slightly smaller than your wrist size. When you purchase a bracelet, realize that if you adjust it, it is not returnable. To adjust your bracelet, be very careful how you adjust it so you don’t make it an odd shape or damage it. If you try to bend an area of your bracelet where there is a stone or inlay, you might pop the stones out. Generally when opening or closing a bracelet for fit, encircle one hand firmly over the last stone on one side of the bracelet and then make your adjustment by bending in or out the portion of the bracelet from the last stone to the end of the bracelet. Do the same on the other side. Traditionally precious metals and jewelry weights are listed in grams. There are approximately 28 grams in one ounce. As always, if you have questions about a bracelet, write me at // orders@horsekeeping.com.